The head of the UK's Flight Safety Committee says that airlines and plane manufacturers are keeping safety training to an "absolute minimum" under pressure to keep their costs low. Dai Whittingham, head of the trade group, said the industry has "less desire to provide training". Boeing said safety was its "highest priority". Mr Whittingham told the BBC that "shareholders are squeezing airlines hard on costs. Spending on training fleets of captains and first officers is not necessarily welcome." "They don't want to sell aircraft that will incur a big training bill for the airline, it is in their interests to keep costs down." "Based upon my research, I have identified that we have a problem with pilot training worldwide, and training is going in the wrong direction which will impact safety," says Ms Petitt, who is based in the US. 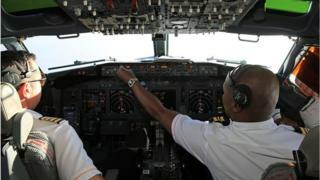 "Pilots are often required to teach themselves the aircraft systems. They learn on their own - with no ground school," she adds. "Is learning from a flash drive the same as structured classroom learning with an instructor? More so, is an electronic exam an accurate assessment of knowledge?" A spokesman for the UK Civil Aviation Authority said: "Safety is our number one priority and the UK has one of the world's safest aviation industries. Commercial pilots undergo extensive training and testing and once qualified continue to be regularly checked and tested." Three of the UK's biggest airlines were approached for comment, but did not want to discuss airline safety. "The expense of having an iPad programme versus having to fly the pilots to a training facility and take them off shift is millions of dollars in additional training costs," a former Boeing pilot told the BBC. When a pilot upgrades to a new model of aircraft it is known as "differences training". In a statement American Airlines, which also uses the plane, told the BBC: "Boeing 737-800 pilots were required to receive some additional training on the MAX 8, which included an hour lesson on some differences. "Additional training was not required, as the 737-800 and the MAX 8 have same type certification."